Summer meadows are full of wildflowers! It’s been a great summer so far. Here is a random selection of experiences that are making this such a noteworthy time. We have lots of rain followed by warm sunny days. The community garden and plants in the yard are all doing very well up to this point. In the garden, the seeds from last year’s cherry tomatoes and sunflowers are growing into large and healthy plants. Being more alert with weed control and regular meals of nitrogen fertilizer has the corn growing well, too. The cornstalks now have ears of corn, with tassels on them. We have picked over 20 tomatoes in the last week and made two containers of sauce! and the tomatoes. The carrots have come in like gangbusters. When you pick a dozen or so, they weigh a pound and their weight and length is like those found at a farm stand or in a supermarket. Fresh carrots and a baguette are a great road food snack. They are filling without being weighty, as happens with deli sandwiches or fast food. We went to Michigan for our nephew’s wedding and enjoyed seeing family. We stayed in a Courtyard in Livonia and one morning, we got to the hotel lobby about 90 seconds too late for breakfast. Unlike other Courtyards, the staff was not in the mood to put out two more meals. At first that seemed to be poor hospitality. But after looking online, we found a restaurant about five minutes away, called George’s Senate Restaurant and Coney Island. The Senate, which serves breakfast all day, is on the edge of a golf course. The breakfast menu has a good mix of traditional dishes and healthy choices. The Senate’s menu says they have the best rice pudding there is and we got two orders to go. When George Dimpoulos says he makes the best rice pudding, he is absolutely right. The rice pudding was custardy with the just the right balance of rice, sweetness, vanilla and cinnamon. My friend, Seymour, who lives in Los Angeles, has in-laws who live in metropolitan Detroit. On a lark, I mentioned the Senate to Seymour and asked him if his father-in-law had ever eaten there. The answer was “yes” and both the food and the golf course got good marks. Dorothy grew up in Youngstown, Ohio and there was a Handel’s that was the ice cream powerhouse of this steel city. After looking online, we learned that the California Handel’s is in fact owned by the same family as the one in Youngstown. 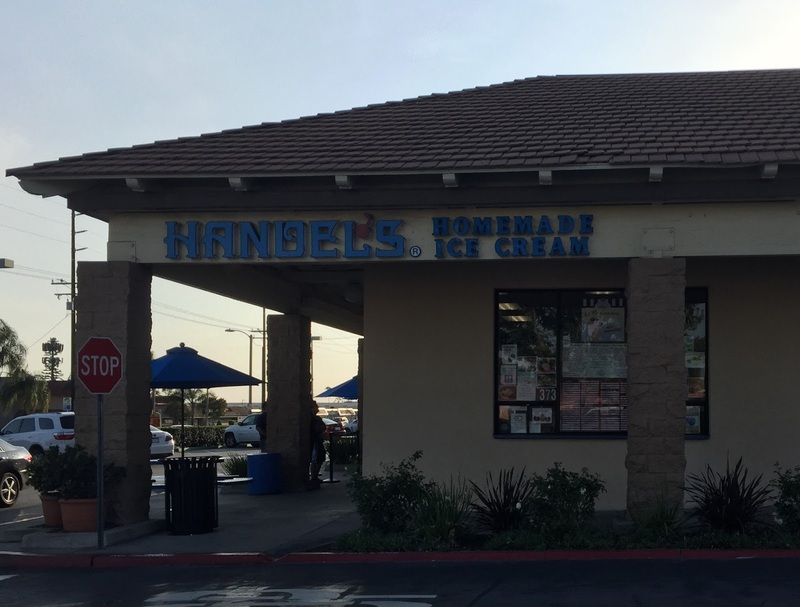 Handel’s ice cream tastes just as good in California as it does in Ohio. It has a creamier and custard-ier flavor than typical ice cream. It was a riot to be able to eat a Handel’s cone at 8 in the evening and know that a flight to Cleveland and an hour drive the next day would allow you to have a second cone in a different place. This idea of flying between coasts for Handel’s ice cream may not be as far fetched as you might think. Some people in Youngstown, Ohio, which is the home of the DeBartolo family owners of the San Francisco 49ers, claim that when the team was in Youngstown for a visit, they liked Handel’s ice cream so much that the team had it packed in dry ice and flown to San Francisco. On the way to the wedding, we stopped in Buffalo. If you have experienced the stereotype of Buffalo as a snow bound citadel of depressing weather, you need to go there and in the summer. The downtown and the adjoining Arts District are supremely walkable. This was important because I ate too large a dinner at D’Arcy McGee’s Irish Pub in the City’s Theater District and needed to walk it off. What a terrific post! I love the "tricoastal" theme! Go Handel's, I'm so glad you enjoyed checking it out! :) Also, I really like the Buffalo pics, you really captured Buffalo! You get around so much, when do you have time for work?